If one should honor truth in advertising, Shifty's deserves some acclaim for the name. It's a classic neighborhood dive, a mile or two from the Las Vegas strip, and caters to bikers and Raiders fans. It was recently "Squiggy's," and at least used to host goth karaoke. 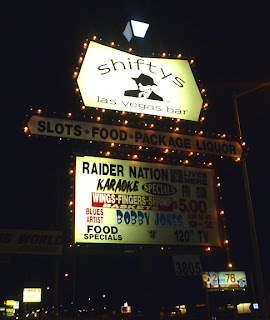 If you want a break from the ersatz Vegas grandiosity and blaring glitz -- or if you just want a strongly poured drink for a low price -- I can't imagine Vegas has many better options than Shifty's.